My entire Christian school ate lunch at the same time, and while I never ate with her, I could always see her. I knew she was close. If Dad forgot to pack my chips, I could seek her out, and she would share hers. If I lost a tooth at school or skinned my knee at recess, I could find her, go to her, and she would help me. I had some sweet teachers, like Mrs. Parson and Mrs. Smith, who would have helped me. But it wouldn’t have been the same. Melanie was better. And as I filed in to the gymnasium with my class for lunch on that first day back to school, I looked for her at her table. Then I realized how stupid that had been! She was gone. I tried to push back the tears as I sat down and opened my lunch. I swallowed hard. I hoped Dad hadn’t forgotten my chips. When school dismissed, I made my way outside, to the place where we used to wait for Dad to pick us up. Only this time, there was no we, there was just me. I didn’t like this new aloneness. I wasn’t cut out for it, I had decided. At supper time, Dad sat at the head of the table, then Melanie, then me, then Mom. We usually enjoyed the talking even more than the eating. It was awkward now. Mom and Dad didn’t want to be sad in front of me, but they couldn’t hide it. I didn’t try to hide my heartache. I hoped they would see how terrible this was and go get her! They didn’t. I would lie in bed and feel the emptiness on her side of the room. It seemed to be tangible. I cried in the darkness, and even resorted to playing Southern Gospel music softly on a tape player in order to get to sleep. Whenever I used to have trouble sleeping, Melanie would cuddle close to me and whisper a story. It was easy since we had scooted our twin beds right up against each other. We each had our own electric blankets and the controls hanging on her bedpost gave a dim, warm glow in the winter time. After she left, I had more trouble than ever getting to sleep, and all I had was a dumb old tape player! I suppose I’m remembering all of this because my sister, Melanie, just had to send her son to college. I’ve been grieving for her, across the miles, because I sort of know how it feels. The transition seems to be easier for the people who leave than it is for the ones left behind. Melanie was at college making friends, learning things and seeing Chicago. I was at home staring at her empty chair and hearing the echo of her laughter in my mind. I learned early that change – and loss – is hard. As I began down memory lane, though, I came across the picture at the top of this page. How true! 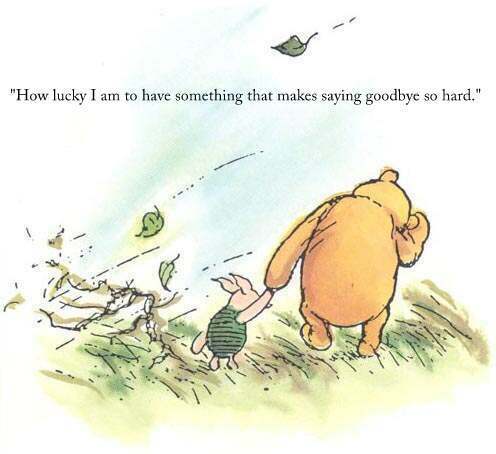 I have experienced loss and sadness, like a lot of people, but the reason I felt it was because I was so lucky! I was so blessed to have a sister who was my friend. She didn’t argue and bicker with me, she loved me and took care of me. Not many girls can say that about their older sister. Our sweet fellowship is what made – and still makes – saying goodbye so hard. How lucky I am to have that! How wonderful it is that I have a loving mother whom I miss terribly; and to have had a Dad who was my friend and a real-life Christian hero. It’s hard to be downhearted when I think of how privileged I am to have had, and still have, these people in my life. I love you, Mom and Melanie, and I love Dad. I’m so lucky to miss you. It’s hard to type through the tears, but I love you, too!